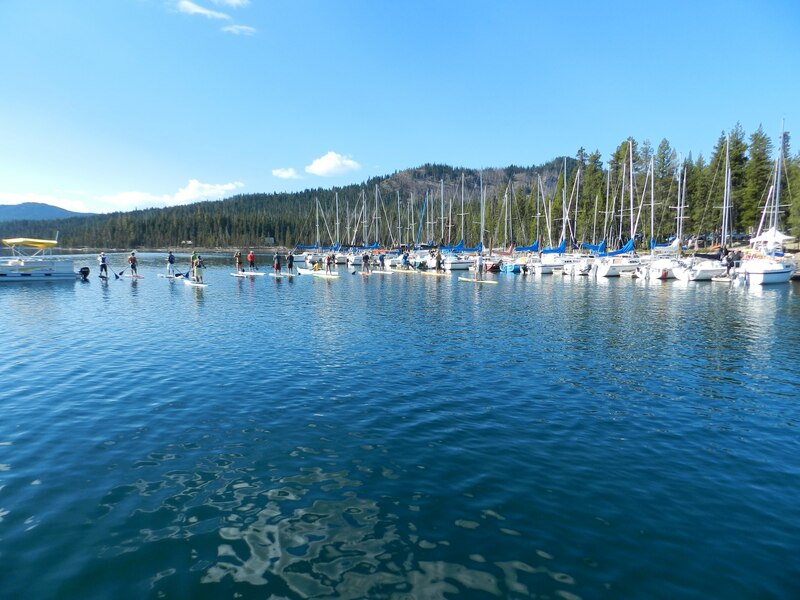 From the glacial blue of a high mountain lake to the azures of a tropical sea, a great deal of the awe for standup paddlers is simply standing high above our favorite waters drinking in color. I recently saw a photo of one of my favorite elite SUP athletes, Candice Appleby, playfully skimming along on a sweet wave. She was wearing her trademark grin as well as a fitted paddling top in a variety of colors that looked just right against the blues of the sea and sky. A challenging place to take a standup paddle. 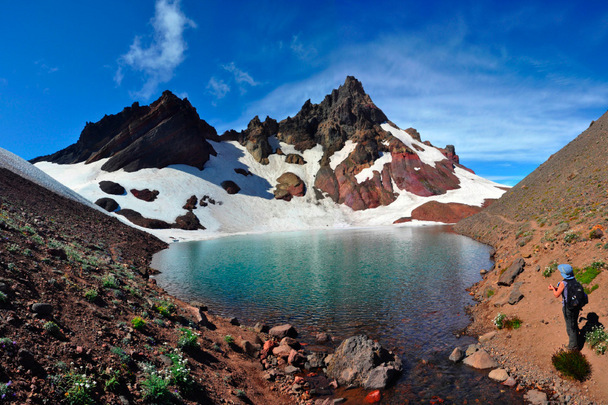 The 2 mile trail to this lake at the base of Broken Top mountain (Oregon) is rocky and steep. I took some time to search out just what she was wearing and got a solid clue from the logo on her compression tights. I noticed she was wearing a very stylish two-toned blue racerback tank top. There was just something about the color of that top that had me suddenly exploring all the links of the Sweet Waterwear website. Since I like to keep sun off me as much as possible and I live in Central Oregon (land of the “don’t blink or you’ll miss it” summer) I was immediately drawn to their crew neck long sleeve style. The top arrived in the same color combination I had admired Candice wearing at the race (their Pacific & Sky color combo). That combination made me happy just looking at it. I hoped the size would be just right so I could take it on our weekend SUP camping trip to the high lakes. I was pleasantly surprised that the medium fit extremely well – as I sometimes need a large. 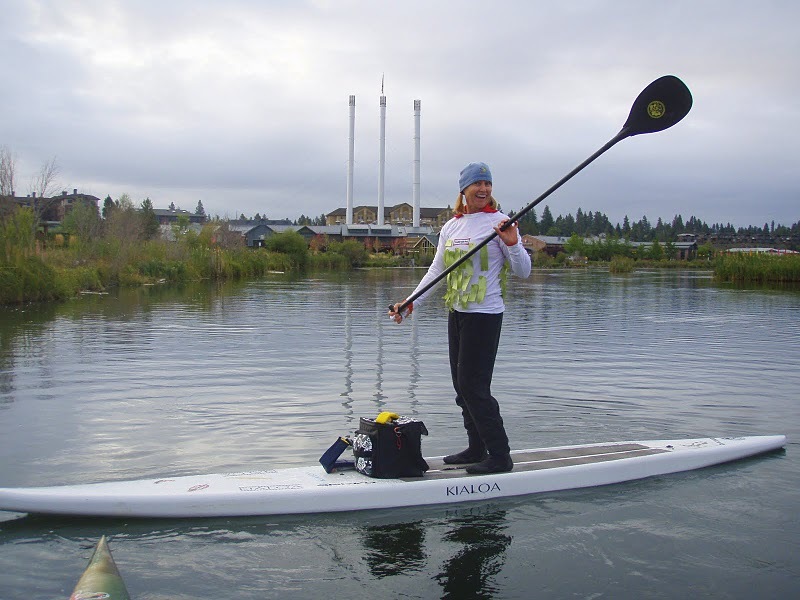 My back and arms have gotten strong and more “robust” after a summer of great SUP training. ) I noticed the content was 18% spandex so it has plenty of stretch to accommodate most all figures and shapes in a nice slightly fitted and very flattering way. Clearly a lot of careful thought and skilled design has been put into their styling and the all-important fit. On the website, the material the Long sleeve top is made of is described as “Silky Soft Comfort– Our special tricot knit is soft & satin smooth, no chafing” You know how marketing speak goes, we mostly take it with a grain of salt. In this case the description was solidly right on! I had planned to simply try on the top, check the size then pack it in the duffel bag for the camping trip. Once on, it felt so darn good that I wore it the rest of the afternoon while packing and loading the boards. Even though I was paddling the cooler high lakes of Central Oregon I was cozy and comfortable even on the frosty mornings in my Sweet Waterwear top. I felt on top of the world amidst a palette of blues – quite a bit like Candice did in that one intriguing photo I saw. I have to mention that the same day I got the long sleeve top, I got a pair of Sweet Waterwear’s women’s pro elite performance tights. The story of why I got them (I am certainly NOT “elite”) and my experience with compression tights is coming up in a blog article very soon.